On Wednesday, a bubbly woman rushed in to meet me at the reception desk of my hotel. She had ruddy cheeks and cold hands. “Cold hands, warm heart!” she gushed. This was Tatiana and she had come to sweep me away to the countryside relaxation complex known as “Razdolye.” But first she has an idea. “We should live spontaneously. Let’s visit Cheboksary first and then head to Razdolye.” I eagerly agreed because I had been trying to figure out how to do just that. Cheboksary is the capital of Chuvashia, another Russian republic. 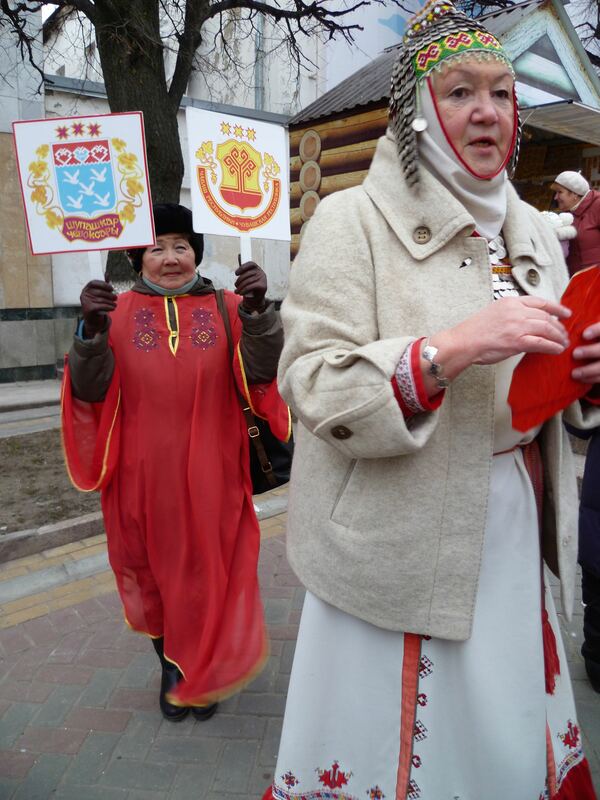 Chuvashia is home to the Chuvash people, who are an ethnic mix of Finno-Urgic and Turkic peoples. We got into Tatiana’s impressive SUV-truck combo and our driver, Sergei, carefully made his way through Yoshkar-Ola. Tatiana gestured to points of interest while she handled some business on her cell phone and Sergei enthusiastically told me about all the changes that have recently come to Yoshkar-Ola. Tatiana jumped back in to the conversation and explained that the head of the Mari El Republic has been traveling in Europe and decided to add some European elements to the city to beautify it. So the city now boasts an embankment modeled on one from Brugges and a Serbian Glockenspiel. Additionally, he built a Kremlin. In some ways this improvement project seems odd, but on the other hand, it sounds like something Peter the Great would have done. After we get outside the city, Tatiana tells me a little more about Razdolye, her “social project,” as she calls it. Tatiana grew up in Mari El—her father taught at one of its institutes. She is ethnically Russian, but she recalls how Russians and the Mari have coexisted for quite some time. After the fall of the Soviet Union, Mari El suffered from a lot of the same problems faced by other rural areas: growing unemployment, collapse of the educational system, fallow fields. Tatiana and her husband made their way to Moscow, where they worked for several years in banking to establish a firm economic foundation. But Tatiana always wanted to return to Mari El and do something for her community. She built Razdolye, a recreation complex that promises “Europe in a corner of Mari El.” The complex employs people from surrounding villages and is working to be agriculturally self-sufficient. For example, they have cows, goats, chickens, etc., and all their berries and mushrooms are local. By the time she tells me all this we are in Cheboksary. We have been told by the tour company to meet in Red Square. But we drive around and around and can’t find the place. 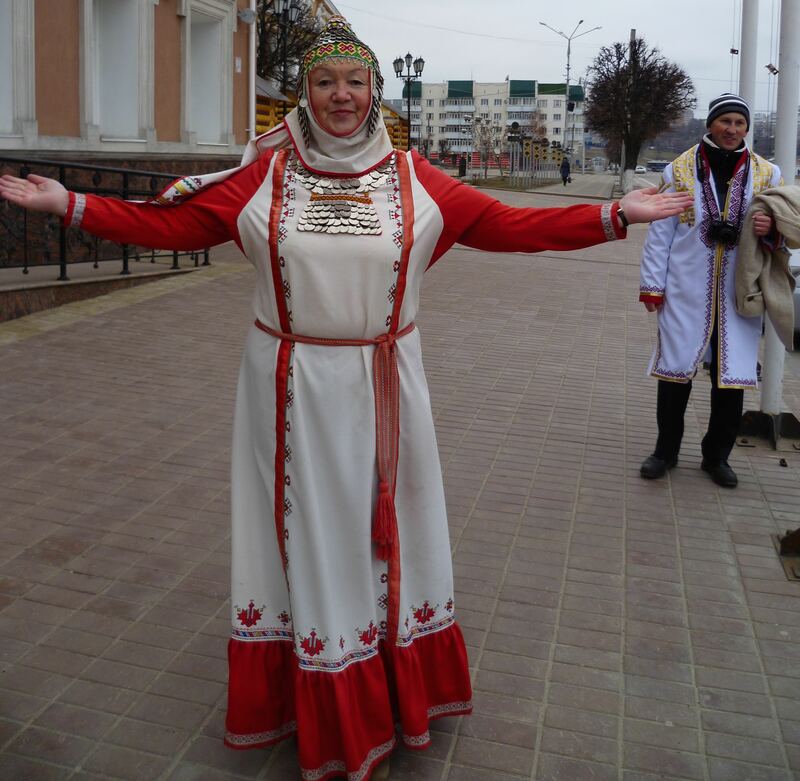 Finally, a woman in Chuvash dress stands in a parking lot waving at us and we pull in. We get out of the car and she rushes to great me in what must be the Chuvash language and then translates her greeting into Russian. Behind her is this man who keeps snapping photos of us as we walk. We turn onto a pedestrian street and a young girl and an older woman appear out of nowhere and seem to be engaging in some sort of semaphore. The man with the camera continues to snap away. I begin to think I’m hallucinating until I realize they are engaged in an explanation of the various symbols on the Chuvash flag. Still don’t know why the paparazzi is here, though. 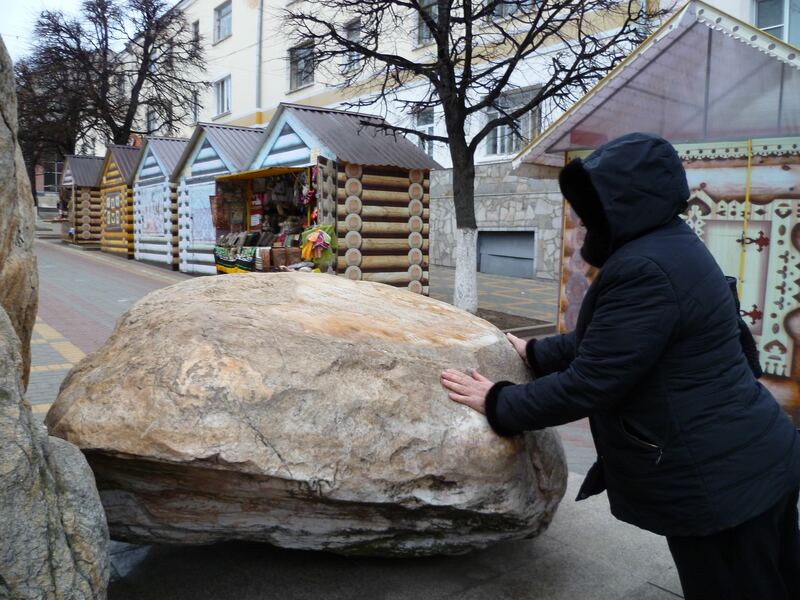 There’s this magic rock that you are supposed to touch and it will grant your wishes. Tatiana touches it here. But they tell me I need to really get up in there, rockwise, so they keep pushing and pulling at me to get me positioned so I can touch all three magic rocks at the same time. I forgot to wish for anything. The older lady gets in the car with us and we begin our tour of Cheboksary. It lasts over two hours and largely consists of statements such as “And this the street named after Ivanov, it used to be named Petrov street, and then Lenin street. There is a monument to Ivanov in Athens. The Athens monument is 8 feet high and bears a ceremonial wreath. There are three stars on it which symbolize his birth, his death, and his lasting legacy.” Etc, etc. We explain several times that we need to hurry up with the excursion because we’re trying to make a ferry, but she refuses to shorten her tour. At one point, Tatiana asks her if she can finish it up within 20 minutes and the guide says, “No. Absolutely not” and just keeps on talking. We’re at her mercy because she’s the only one who knows her way around Cheboksary. So she shows us the trolleybus station (established 50 years ago!) , and the hospital (established first in another location but now in this location! ), and the musical and ballet theater (it used to just be called the musical theater! ), and then makes us get out of the car to go look at the eternal flame, even though it’s freakin’ 23 degrees out. At least we find out why we couldn’t find Red Square: it was flooded over in the 80s with the arrival of the new dam across the Volga. Finally, the tour blissfully ends and we head into the Chuvash beer museum. Oddly, the tour guide at the beer museum claims that the Chuvash beer museum is one of only two in the world. She then explains how beer is made, sort of. It’s not exactly beer she’s explaining because she says its alcohol level can only get to 4%. Also it spoils in 19 hours. We see a photo of Putin at the beer museum and then get to taste some beer they’ve made. It’s good, if a little odd, so we all buy some to take home with us. We head upstairs to the “traditional Chuvash restaurant,” and first eat a soup containing the heart, lungs, and kidneys of some animal. Don’t know which one. It’s fine, except that the lung has a rather disconcerting texture. We’re then served some horse sausage, which is really pretty good. Chuvashia, you’ve been interesting, but it’s time for us to make our way to Razdolye.